A recent British Council report paints a stark picture of the UK’s declining competitiveness as a global study destination. 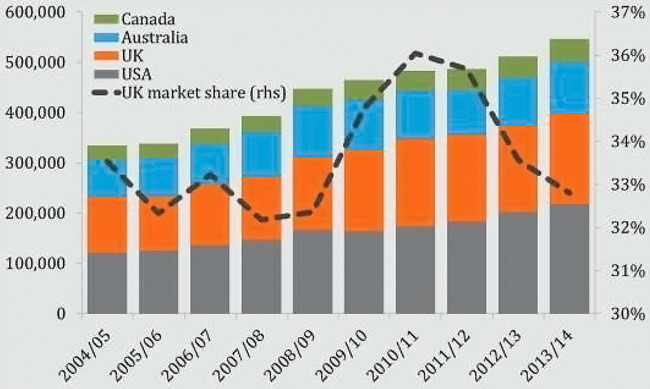 International enrolment in British higher education fell in 2012/13 for the first time in 29 years. And, while foreign student numbers rebounded modestly the year after, some of the underlying trends remain troubling. As it happens, 2015 is no ordinary year in the UK; it is an election year with the vote scheduled for 7 May. Immigration remains a hot political question in Britain but public sentiment running strongly in favour of tighter immigration controls, and with recent polls showing the Labour and Conservative parties locked in a dead heat, it may well be that neither of the leading contenders for power will take the chance to introduce bold new policy directions for immigration. Recent years have seen vigorous debate within the UK as to whether international students should be included in the government’s “net migration” targets, and a series of changes affecting student visas have been hotly contested by educators and students as well. Against this backdrop, two peak bodies have released wide-ranging statements over the last two months calling for greater competitiveness and fairness in Britain’s international education sector. Both are squarely aimed at influencing debate leading up to the election as well as lobbying the country’s next government in the wake of the spring vote. The manifesto sets out a series of ten recommendations designed to make the UK a more welcoming and attractive destination for qualified international students, increasing Britain’s share of the international student market, and advancing the country’s standing and influence in the world. 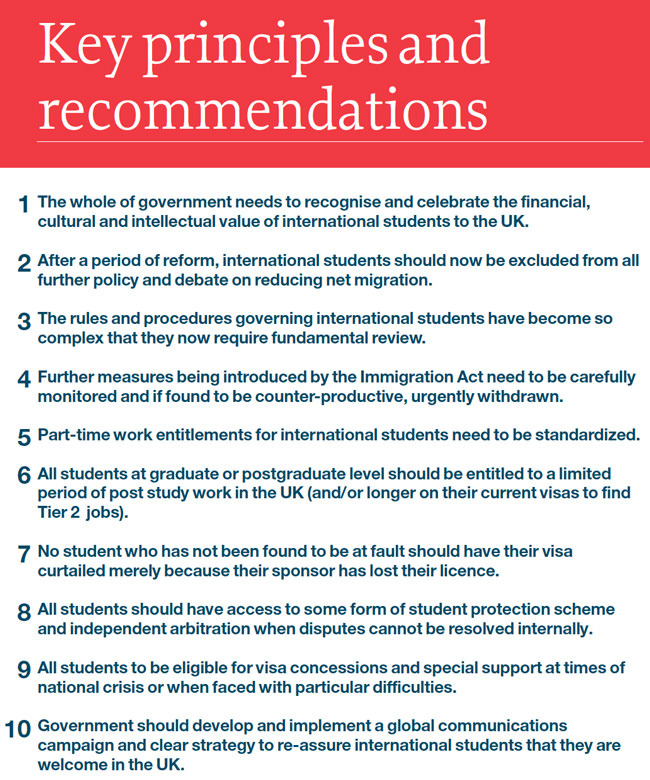 The recommendations (please see a summary table below) focus on greater cohesion in government policy, particularly with regard to immigration, and protecting the rights and interests of international students in the UK. The statement makes the point that, prevailing British views of immigration aside, research shows that the public do not see international students as “migrants” and that a series of parliamentary committees have explicitly recommended that students be excluded from the government’s net migration targets. “This now needs to be accepted by government, as a matter or principle,” the manifesto concludes. A second statement released earlier this month, this time from Study UK, the country’s lead association for independent higher education institutions, echoes UKCISA’s broad themes with respect to global competitiveness. It also introduces some additional calls for an improved regulatory context for higher education in Britain. Within the wider scope of the manifesto is a series of recommendations intended to advance the position of the UK as the “global home of education.” It calls on the next British government to recommit itself to the UK’s 2013 international education strategy and its target to increase enrolment by 15-20% by 2018. As with the UKCISA manifesto, the purpose of the Study UK statement is clear. “We want to start a conversation and want to be engaged with that conversation,” says Study UK Director Paul Kirkham. That discussion has now been joined and is bound to continue through the election this spring and with the government it returns to Britain afterwards. This entry was posted in Europe, Higher Education, Immigration, Regions, United Kingdom and tagged undergraduate admissions, postgraduate student recruitment, undergraduate student recruitment, education abroad, immigration reform.